Dimensions: 25 x 11 x 3. Input Voltage: 100-240V AC Power Input. Work Frequency: 50/60 Hz Suitable for Global Energy Environment. Output Voltage: UL Standard Output Voltage Less than 76V DC. The Future of Indoor Gardening Has Arrived. 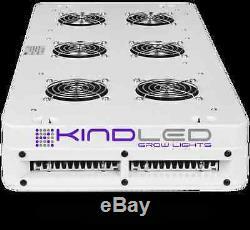 The K3 - L600 LED Grow Light. 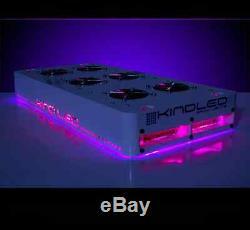 The Kind K3 LED Grow Light is the Best LED Grow Light because. 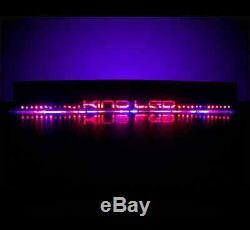 Use a proprietary 12 bandwidth spectrum comprised of 3 watt diodes that run at 650mA. Lesser LED grow lights run at 500mA with only a 6 bandwidth spectrum. Thick, heavy duty 2 CM aluminum heat sinks that dissipate heat much more efficiently than other LED lights, making Kind LED lights run more effectively and cooler leading to longer lifes and increased performance. Revolutionary Secondary Optical Lens for maximum photosynthetic penetration from plant top to base, considerably increasing "under canopy" production and yield. 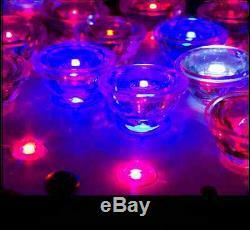 These Kind LED lights will match or outperform any other 3 watt LED grow light, including much higher priced brands. These Kind LED grow lights use only about half the electricity as HPS lights, and produce much more yield per watt. Many studies have even show an increase in oil production and quality, closer inter-nodal spacing, and denser fruits and flowers. Also, because these Kind LED grow lights produce less heat, they do not need to be air-cooled like HPS lights, therefore eliminating the need for additional fans, which also makes them run quieter. Kind LED lights run cool, so cool in fact that no additional temperature control equipment is needed besides the internal circulation fans. Lower light temperatures lead to a much more easily maintained ideal grow environment in which your plants would thrive. Because the individual diodes of a Kind LED light are set to a specific color and in a specific proportion, we are able to emit the exact spectrum that a developing plant would need to thrive, with little to no waste. The 12 band complete spectrum is designed to perfectly match the growth needs of your plants. Kind LED Growers will be able to simplify their grow rooms, save on electrical consumption, keep their rooms cooler, and perhaps most importantly, experience a marked increase in the quality of their fruits, flowers, and vegetables. LED lights are made up of many small LEDs, or light emitting diodes, that each project one specific wavelength of the electromagnetic scale. We interpret this as the visible (although sometimes invisible) color of a diode. Plants use and absorb an array of colors from 400nm to 700nm in order to carry out photosynthesis. 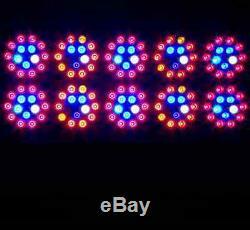 Many LED companies only use 2-3 of the primary colors needed for photosynthesis and plant growth. Plants that are not receiving their complete lighting spectrum needs can become leggy and produce only wispy flowers. Kind LED Grow Lights feature a complete 12-band spectrum that provides your plants every lighting component needed for robust and complete growth, throughout all stages of their life cycle. Another major Kind advantage is the use of the revolutionary secondary optical lens which penetrates deep into the plant canopy to reach secondary and tertiary levels, thus maximizing yields by creating a higher overall number of viable dense flowering sites. Our 3 watt diodes running at a 650ma driving current incorporate the perfect blend of intensity, efficiency, durability, and low operating temperature, making them the superior choice. Many other LED brands are running with lower diode wattages and lesser driving currents, making them an inferior option when compared with Kind LED Grow Light. 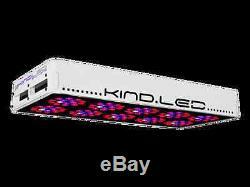 Kind LED grow lights are the ONLY 3 Watt grow lights that feature a 12 bandwidth full spectrum LED panel, a secondary high intensity optical lens, and 2CM aluminum circuit boards. These 3 Watt Kind LED lights will match or outperform any other similar 3 watt setup that is seen often throughout the web, regardless of price or claims. To Grow the Best, Grow WITH the Best, KIND LED. Additional High Low Hydro Information. Please feel free to message us with any questions at any time. We always respond within 12 to 24 hours, but usually respond in less time. 48 contiguous United States only. Our return address will not show High Low Hydro. 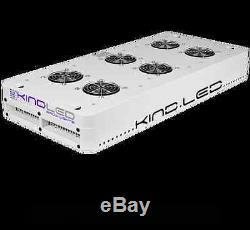 The item "Kind LED K3 L600 Full Spectrum Grow Light 600W for Indoor Growing" is in sale since Monday, July 24, 2017. This item is in the category "Home & Garden\Yard, Garden & Outdoor Living\Gardening Supplies\Hydroponics & Seed Starting\Grow Light Kits". The seller is "highlowhydro" and is located in Atlanta, Georgia. This item can be shipped to United States, Canada, United Kingdom, Denmark, Romania, Slovakia, Bulgaria, Czech republic, Finland, Hungary, Latvia, Lithuania, Malta, Estonia, Australia, Greece, Portugal, Cyprus, Slovenia, Japan, China, Sweden, South Korea, Indonesia, Taiwan, South africa, Thailand, Belgium, France, Hong Kong, Ireland, Netherlands, Poland, Spain, Italy, Germany, Austria, Israel, Mexico, New Zealand, Singapore, Switzerland, Norway, Saudi arabia, Ukraine, United arab emirates, Qatar, Kuwait, Bahrain, Croatia, Malaysia, Brazil, Chile, Colombia, Costa rica, Panama, Trinidad and tobago, Guatemala, Honduras, Jamaica.